AN IRISH RAIL customer service representative addressed a passenger’s complaint of overcrowding by saying that the issue could not be resolved without increased government funding. In an email response to a customer complaint on the 5.15pm service from Dublin Connolly to Longford this month, a customer care worker said that there “was no easy solution to this problem”. “I would like to apologise on behalf of Iarnrod Éireann for your uncomfortable experience on the 17.15 service to Longford, specifically,” the representative said. “The capacity on this service has been reduced to a 4 carriage as our Operations Dept decided to increase capacity on an earlier service to Drogheda as numerous passengers were being left behind in Pearse station. “Due to a severe shortage of available carriages overcrowding on all routes is unavoidable. “Unless the government increase subvention and allocate funds in order to purchase extra carriages, there is no easy solution to this problem. There have been several complaints in relation to your service so I am sure this issue will be reviewed shortly. The response was highlighted by Dublin city Green Party councillor Ciaran Cuffe, who said that overcrowding is “clearly an issue” on Irish Rail trains. “It is clearly an issue and I think it can be difficult for commuters to get a seat or space on some trains in the morning,” he said. “And yet the government seems to be focusing on roads rather than public transport in their funding priorities. I would appeal to Minister Ross and the government to give public transport the funding it deserves. There are numerous complaints around overcrowding on various Irish Rail routes at peak times. Last year, Irish MEP Marian Harkin took to Twitter to complain about overcrowding on the Sligo to Dublin train, describing it as “not safe”. Other passengers have also taken issue with overcrowding on the route in the past. The train stops at Maynooth university and is a busy commuter line. Passengers on other routes – including major commuter lines in different counties – have also taken issue with overcrowding. 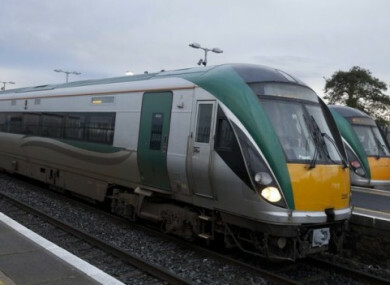 In response to a query from TheJournal.ie, an Irish Rail spokesperson said that passenger numbers were growing and that the service was investing in expanding its fleet. They said that the National Transport Authority was supporting of its tender to refurbish disused carriages. The spokesperson said that funding decisions were “expected imminently” on an expansion of its existing fleet. “We are seeing growth and will need the investment [from government] but we believe the investment is there,” the spokesperson said. Email “'Unless the government allocate funds... there is no easy solution': Irish Rail responds to overcrowding complaint”. Feedback on “'Unless the government allocate funds... there is no easy solution': Irish Rail responds to overcrowding complaint”.